Our Staff - R.L. 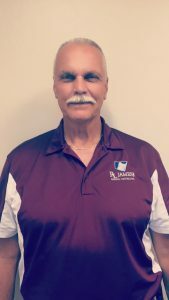 James Inc.
RL “Bob” James began his career in the paint industry in 1978 as a clerk in a paint store, and quickly became a store manager. In 1981, he became an estimator and eventually project manager with a large waterproofing contractor, which brought him to the condominium maintenance industry. It was clear from the onset that Customer Service and Quality Craftsmanship would become cornerstones of the RL James Inc philosophy. After ten years’ experience with extensive projects and a growing desire to become an entrepreneur, he formed RL James, Inc in 1988. Dedication to employee development, training and mentoring continues to fuel one of our greatest assets – our employees. In 2012, three top executives became “Partners” with RL and shire in the benefits of ownership. Gary Wasser (VP), Bob Branscombe (VP), and Kevin Phillips (President), complete what is now one of the most experience leadership teams and strongest infrastructure in the state of Florida! Since day one, RL’s direction has been that each job starts and finishes with Safety, Quality and Customer Satisfaction. These guidelines have helped us gain numerous long term relationships. Due to the positive experience clients have had the first time; many projects are contracted with us a second and third time. As of July 24, 2011 we have three offices and twenty crews supervised by experience Foreman and Superintendents. 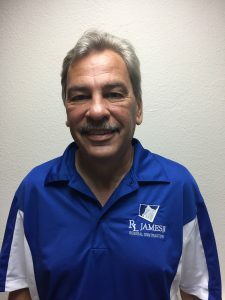 Bob James makes himself available to not only our key staff, by enjoys periodic on-site inspections each month throughout our entire service area. Our financial health and experience has provided us with the criteria for bonding capacity of up to $10,000,000 per single project! If you are one of our many valued clients we thank you for your business. If you haven’t had the chance to see our superior quality work in action, we hope you give us the opportunity to share with you our year’s expertise and commitment to excellence. 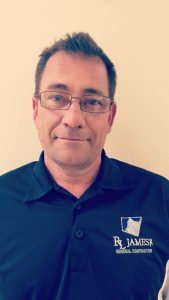 Kevin Phillips first started his career at RL James Inc in January 2004 as an Estimator and Project Manager. Through the years, he has earned roles such as Director of Sales and Administration, Vice President and his current position as President. Kevin received his General Contractor license in 2010 and shares the responsibility of GC Qualifier for the company. 2013 took on a new role as partner in the company! Kevin graduated from East Carolina University with a bachelors of Science degree. 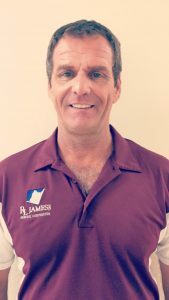 He also holds a master certification in concrete repair, certification from the Paint Quality Institute, and certification in window installation and glazing from multiple manufacturers of hurricane impact-glass companies. Kevin has been a resident of Fort Myers since 1983 where he lives with his wife Linda. In his spare time Kevin enjoys riding his motorcycle, the occasional artistic endeavors and spoiling his grandchildren. 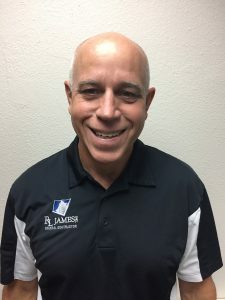 Gary Wasser joined RL James Inc in 2003 as a regional representative in the Manatee, Sarasota and Charlotte county areas. In 2008 he was promoted to the role of sales manager and where he oversees the company’s sales and estimating staff in addition to existing responsibilities. Gary has served on the board of directors of the Florida West Coast Chapter of the International Concrete Repair Institute since 2006 and also held the role of Treasurer in 2010. In 2013, Gary also joined the rank of partner in the company. Gary earned his Bachelor of Science degree from Trenton State College in 1984 before relocating to Florida. 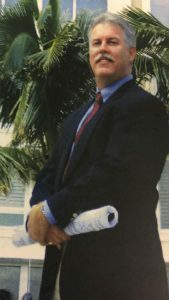 In 1993 he earned his license as a Community Association Manager and worked for ten years as a condominium manager on Longboat Key. Gary currently resides in Tampa with his wife and daughter. His eldest daughter is currently in college where he spends much of his free time watching her dominate the field on the college soccer team. In his spare time he also enjoys…. 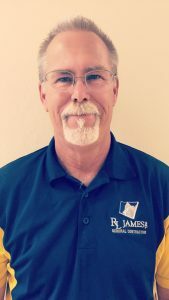 Robert “Bob” Branscombe joined RL James Inc in 1997 as a field employee. His skill set soon earned him the role of Project Manager where he oversaw thousands of projects before earning the title of Vice President of Production. 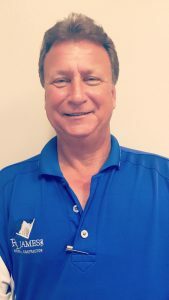 Bob still maintains his project manager position in our northwest territory but he also oversees the entire production operation for the state of Florida. Bob became a partner in the company in 2013. Bob is our resident New Englander where he grew up on an Oakfield Maine farm before moving to Florida in 1983. In his free time, Bob enjoys cruising the Caribbean, golfing, and spending time with his son Tyler and 2 grandchildren. Don Murray joined RL James Inc in 2002 as the Production Administrator and Human Resource Manager where he still maintains these roles. Don assists the Production department with scheduling, manpower, and conflict resolution. Don hails from Upstate New York where he lived for thirty-seven years before moving to the sunshine state! He currently resides in Lehigh Acres with his wife Marla. In his free time he enjoys spending time camping with his children and grandkids. Seamus Devlin joined RL James Inc in 2013 as one of our regional project managers specifically for our east coast team. Seamus has been working in the construction industry since 1989. He is a mason by trade completing his apprenticeship in 1991. Seamus is a member of ICRI. He is also a certified installer of Watson Bowman Acme and Emseal Expansion Joints and Sika Carbon Fiber. Seamus is was a licensed EMT/Firefighter for a number of years. Currently resides in Ocala with his with his wife Roxanne, 5 children and 2 grandkids. In his down time he likes to boat, golf, family and friends. Actively involved with son’s high school football team. Joseph Olszewski 1995-2004; 2016. Superintendent to Project coordinator oversaw hundreds of projects for south and east coast. Project manager for the south region along with assisting with the in-house estimators. OSHA certified and swing stage and scaffold erection certified, chemical grout injections. Blue print reading school. Certified in Sarnifil roofing/waterproofing heat welding systems. 17 years old joined iron workers hall in Orlando Florida 272. Been in construction ever since. Resides in Naples with wife Vivian, 3 children and grandchild. Spare time honey-do-lists, relaxing at the beach, gun range, nascar races. Competitive model builder- race cars winning a world of wheels competition 1st place open class nascar. Bowling leagues. Gary Howe joined RL James in 2013 as the Superintendent of our aluminum division where he work for approximately two years until stepping into the role of Aluminum Manager in 2015. Gary has been an integral part of our newly established aluminum division. Gary resides in Port Charlotte with …. Gary is an avid fossil finder…. Harry joined RL James in 2017 as Warehouse/Purchasing Manager. He has over 30 years of experience in the Painting and Waterproofing industry. He also has 14 years of experience in the Concrete Restoration Industry. He has been involved in all business lines including, Safety Management, Safety and Skills Training, Estimating, Budgeting and Project pre-planning. Graduated from Admiral Farragut Academy with JNROTC Honors. Attended Manatee Community College. Harry resides with his wife Brenda in Bradenton and has a daughter and son, Ashley and Dylan. He enjoys golfing, fishing and football. Nicole Greer joined RL James Inc in 2012 as the front desk and payroll administrator. Within a year Nicole transitioned in to the Accounts Payable position where she is the current department head. She also functions as the companies Office Manager. Nicole graduated from Florida Gulf Coast University in 2007 where she earned a Bachelor of Arts degree. She currently resides in Cape Coral with her husband Justin and daughter Addison. In her free time Nicole enjoys spending time with her family, traveling, going to the beach and is actively involved in business community events. 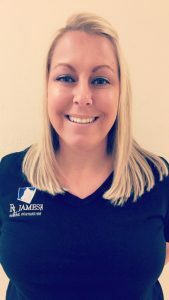 Vanessa joined RL James in 2017 as the Receptionist, Vanessa showed her loyalty and dedication to the company and is now the Accounts Receivable department head. Vanessa grew up in the Ft. Myers area, she graduated from Riverdale High School and shortly after started school at the Universal Training Institute. She received a certificate of completion in Medical Billing and Coding. Vanessa currently resides in Lehigh Acres, FL with her daughter Yalita and dog Roxy. In her free time she enjoys fishing, taking walks on the beach and spending time with her family. John Dahin joined RL James Inc in 1993 bringing thirty-five plus years of knowledge in general construction with him. John stepped in to the position of sales and has worked in a variety of roles with the company as needed; project manager and corporate financial officer. John holds the title of Regional Sales Representative for the east coast of Florida. John works closely with engineering and property management firms and association-employed managers related to the planning and completion of large, sometimes extremely complex, structural concrete repair, waterproofing and painting projects. John is also another GC qualifier for the company. John resides in Altamonte Springs. In his free time, John enjoys fishing and traveling to his vacation home in Vermont and cabin in Ocala. Vic Dudash was previously employed with the company from 2006-2009 as Regional Representative before taking the leap and starting his own company. We welcomed Vic back in 2014 as, once again, Regional Representative for the southwest region of Florida. Victor has immersed himself in our local chapters with BMI, CAI, and ICRI. Laura Joined R.L. James, Inc, Bradenton in February 2018. She has a Bachelor of Science Degree in Hospitality management. Having worked in the aluminum window industry for 10 years, and the last 20 years in building weatherproofing, protection and restoration, as an Administrator and Office Manager, she is well versed in the administrative functions that keep our projects running smoothly. From Project Start to finish she has the experience to provide the organization with assistance in numerous areas. She lives in Bradenton, with her 2 dogs. She enjoys spending time with her 2 daughters and family who have recently relocated from Upstate NY to Bradenton.